I have been spending most of my time this week, at the Gateway Theatre. We are in Technical Rehearsals for a show I have been working on, as acting coach for a couple of lovely, talented child actors. “Tech Week”, as it is known, involves very long hours, and can lead to people eating large quantities of junk food. I have been having cravings for Wagon Wheels. Yet another sweet of my Canadian childhood (although they were originally British and Australian), I remember them being ideal for lunchboxes, because they were flat and would fit perfectly on top of your sandwich. They were a great trading commodity, if you were lucky enough to have them, worth at least three homemade chocolate chip cookies. 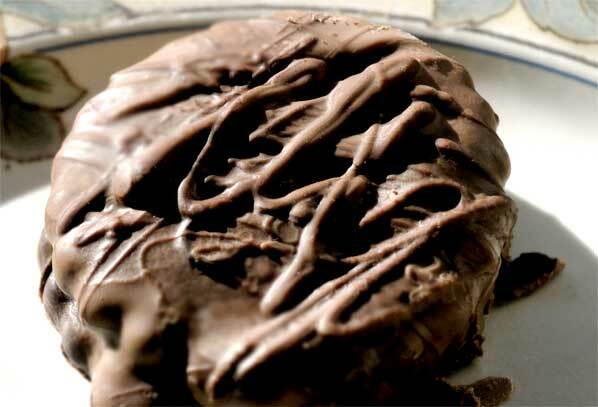 A Wagon Wheel is made up of two big flat plain cookies, sandwiching a filling of marshmallow and jam, and coated in chocolate. Apparently, they are similar to Moonpies (made in the Southern United States), which I have never had the pleasure of trying, but now want to. Clearly, great minds think alike. Mmmmm, I am off, lost in the thoughts of a huge mouthful of chocolate, biscuit, jam and marshmallow. Not exactly a reasonable request to make of teenagers. But they are remarkably patient when I am in this kind of mood, so they got up and we all had a lovely breakfast together. And we chatted, and we told jokes, and we caught up on the last few days. And someone had to clean out the cat box, and clear the dishes, and by the time we started our baking project, time was running out. 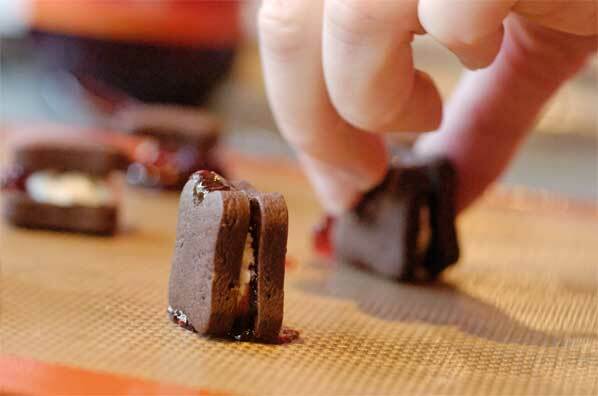 I looked up the recipe I had found for homemade wagon wheels, courtesy of Kitsch in the Kitchen. We were able, together, to get the chocolate dough concocted, and left it chilling in the refrigerator. 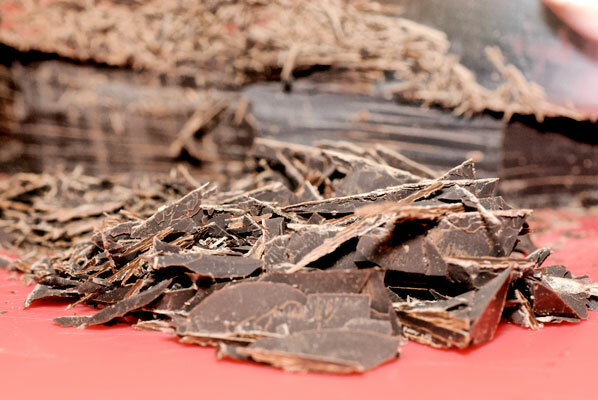 I then got out the lovely, fragrant, bittersweet Callebaut chocolate, and skilfully – I do have to say, I am getting rather good at grating chocolate – got a bowlful of it ready for tempering. Then, I looked at the clock. Rapidly barking out orders for completing our “fun, family, quality time” project, I raced out the door, and off to the theatre. When I arrived home at Midnight, I was exhausted and craving some comfort food. A beautiful sight met my eyes, as I opened the door. 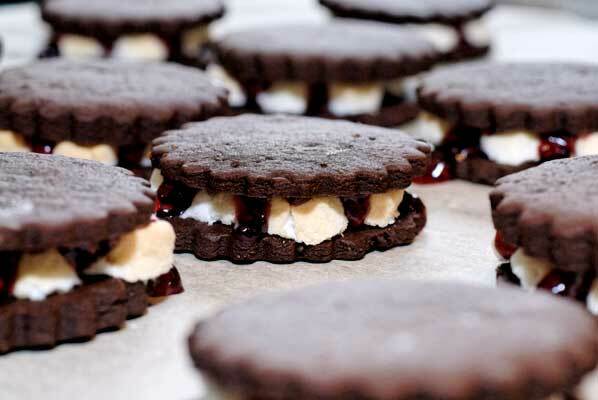 My kids had made a glorious batch of hand-dipped wagon wheels, in two variations (one with jam, one without). Upon closer inspection, they had actually used both dark and milk chocolate, and had managed to get a really neat swirled “light on dark” effect on the tops. I attempted to shove one into my mouth, whole , made a huge pile of crumbs and grabbed another one, to eat in bed. Well, I did take a plate with me! They were heaven, absolutely delicious, and I think the combination of the two chocolates made a superior product. After all, more chocolate is always better. The biscuits had a satisfying crispiness, which shattered in the mouth, and made a nice contrast to the spongy marshmallow and fruity jam. They have completely spoiled me for the commercial version. 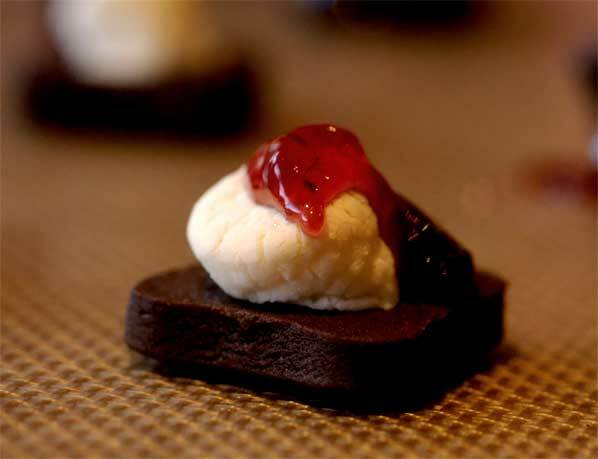 I wondered if I could re-create these satisfying morsels in miniature. Then, a person could pop one, whole in the mouth, without feeling like a wide mouthed frog. Apparently, the current slogan for Wagon Wheels is “You’ve got to grin to get it in”. And a miniature version could be eaten in bed with no fear of crumbs. So, the gauntlet has been well and truly thrown down. I am just so impressed that the boys pulled this off. So are they, and their efforts were rewarded by the whole batch being scoffed, by the end of the following day, by their grateful friends. Next morning, I scoured through my cookie cutter drawer and managed to find some tiny plastic play-doh cutters, about 1 inch square. I made up a batch of the recipe’s chocolate cookie dough, chilled it, rolled it, and pressed one of the cutters into the mass. It popped out a perfect little square of dough. Yes! They baked perfectly, with the time adjusted accordingly, for the much smaller size (5 minutes instead of 12). One miniature marshmallow each, on the bottom surface of half of the batch, instead of the four large marshmallow halves, popped them into the oven for four minutes, until golden brown, then a tiny dollop of good quality raspberry jam on top of the marshmallow, squished them together with another tiny cookie (from the un-marshmallowed half of the batch), and (after half an hour’s rest), hand dipped them in tempered chocolate. I used milk chocolate this time: Callebaut – I really like its warm, caramelly taste. It was an opportunity for me to practice my hand dipping technique. 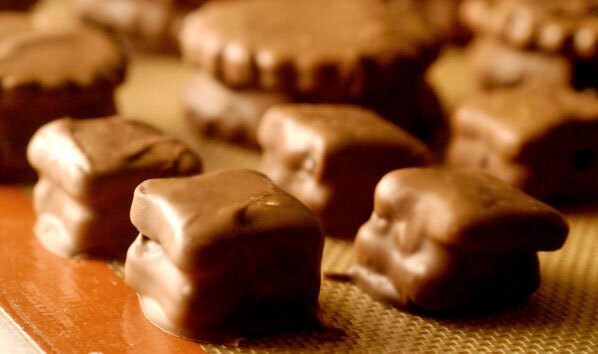 Probably because of the cookies providing a smooth outside surface, they were very easy to work with, and in no time, I had a Silpat mat filled with bonny little morsels, resembling square bon bons. And, with a swirl of dark chocolate atop the light (a reversal of what my sons did), they look very classy indeed. Oh, they are so good. One, popped in the mouth can be left to melt on the tongue and washed down with a big glass of milk. And the tiny size means more of the surface area is covered in chocolate, which is, of course, always a good thing. I may just take them in to the theatre tonight, for opening night of the show – Great Expectations. Which is what I will have from now on, when my kids set out to bake.